Book synopsis not yet released. As Lora's tale continues in The Deepest Night, she is grieving for Jesse and has never felt so alone. The only one she has ever truly loved, and he was taken away from her so cruelly. After being injured, Lora is at Iverson, recovering from the wound inflected by Mandy's father. With her place at the school being threatened to be torn out from under her, Lora cannot see a future past the bombing and spoils of war that surround the country... And the death of her beloved Jesse. As the war continues and the Iverson girls head home for the summer, Lora finds herself aiding fallen soldiers at a makeshift hospital, in Mandy's home, with his father being admitted to a mental institution. When word is sent that Mandy's brother is in fact alive and being held as a prisoner of war... The stars are clear, Lora is so cross the battlelines into enemy territory and rescue him. Why can everyone hear Jesse but her? Both Mandy and Lora set out on the dangerous journey that neither is prepared for, but when Mandy starts to feel restless and uncomfortable in his own skin, they both know that it's only a matter of time before he sheds his skin and the transformation begins. Lora finds herself conflicted, without Jesse and feeling lonely, should she mourn for the boy who was taken from her, or open her heart to the one that is right in front of her... Holding her hand. The deepest night was fantastic, even more so than the first in the series. The romantic interludes have been toned down, and the aspects of war have played heavily throughout the storyline. Lora slowly morphs into a strong and courageous young woman, proud of her heritage, while Mandy comes to grips with his new responsibilities and the rescue attempt of his brother. The story is told in dual points of view from Mandy and Lora, but every few chapters, there are a few passages from Jesse, pining for his beloved and trying to reach her with his song. I love the vivid descriptions of the wartime era, the attire, the lavish surroundings. 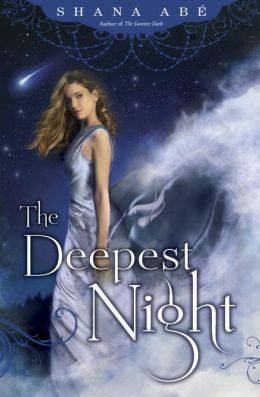 I still don't fully understand the concept of dragons, stars and the connection, but completely forgot my confusion during The Deepest Night, it really was entertaining, intense and couldn't out it down until I had read the entire book.